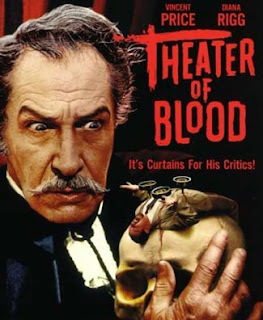 This week we get to the number 3 film in my Vincent Price Top Ten Movies Countdown - it's the 1973 classic, Theater of Blood. It is a fantastic film with a real dark sense of humor - Price plays failed Shakespearean actor Edward Lionheart, who returns from the dead to seek vengeance on the critics who panned his performances. He is assisted by the lovely Diana Rigg... This is a must-see for all Price fans. A real gem. Theater of blood! !